Of course I didn't get as much accomplished as I wanted during FNSI. So how will I finish this? The four seed packet blocks are narrower than the scene blocks. I like the look of yellow to add width but then what? And which yellow? No doubt I'll be pulling out my graph paper and trying to figure this one out! In the meantime, I also need to figure out how much fabric I need for borders on a quilt I finished at retreat last weekend. 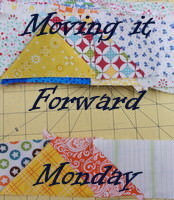 I had won a jelly roll while in Denver earlier this month and completed the center of a lap-sized quilt. 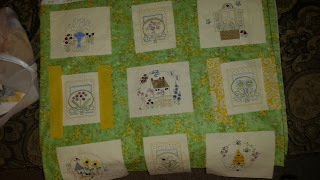 I do believe I'll be donating this quilt to West Virginia. 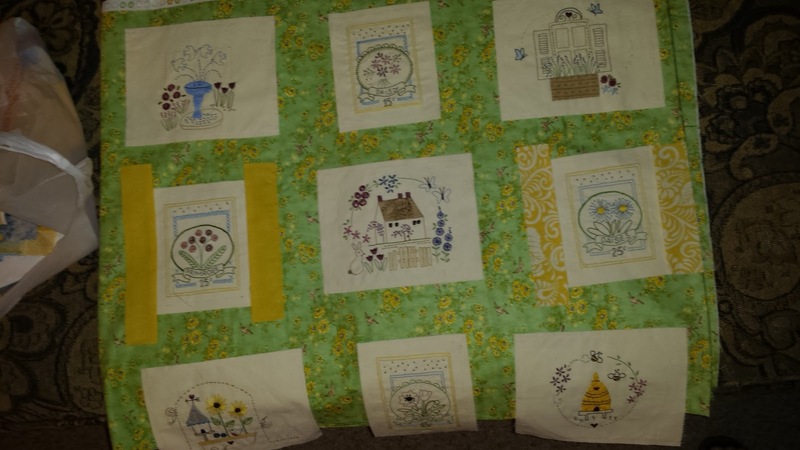 A fellow guild quilter put out a plea for quilts to be donated to her hometown that suffered so much during the recent flooding! Have to run! Got a date with my graph paper! Whoa! It has been exactly one month since my last post! What the heck???!!! Well, I have been super busy. Unfortunately not with quilting or knitting so much but with visitors and visiting! It's all fun so not complaining too terribly much! Now for a sad (but true) confession. 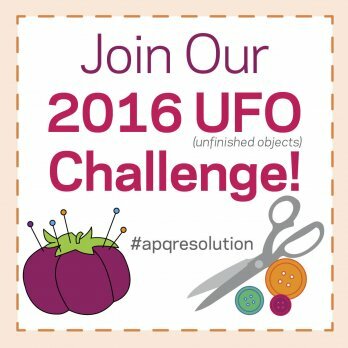 You should know by now that I love APQ's UFO Challenge. My June project was supposed to be the beauty below. I was so excited because all I had to do was add borders and they were all there, cut and ready. Plus so was the binding & backing. I never even looked at again in June. SO.VERY.SAD! Of course, this is a new month and the project for July is the one below. I took it on retreat but didn't even pull it out of my bag. Maybe this will be what I work on during FNSI! That's it! That's what I'll do!!! At least it will be progress in the right direction ... getting UFOs out of the box and DONE! I need to remove the scrappy borders. Not happy with them at all. I'll see what needs to be done after that. I've got a lot of my "inspiration" fabric which is how I based the embroidery floss colors. Next week I'll post pictures from my trip to Colorado. I was gone for 15 days and had so much fun. That's why I was slacking on my sewing/knitting. Plus, before that, my daughter visited for 10 days! Sheesh! It's no wonder I wasn't posting or sewing! That's my story and I'm sticking to it! Have a great day and don't forget to sign up for FNSI!!! You won't regret it!! !